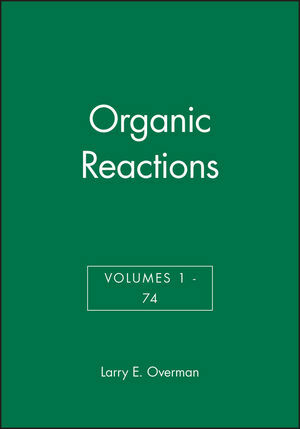 Organic Reactions is a comprehensive series of volumes composed of chapters devoted to a single reaction, or a definite phase of a reaction. The material is treated from a preparative viewpoint, with emphasis on limitations, interfering influences, effects of structure, and the selection of experimental techniques. Numerous detailed procedures illustrate the significant modifications of each method. Includes tables that contain all possible examples of the reactions under consideration. Larry E. Overman is Professor of Chemistry at the University of California at Irvine. 1. ADDITIONS OF ALLYL, ALLENYL, AND PROPARAGYLSTANNANES TO ALDEHYDES AND IMINES (Benjamin W. Gung). 2. GYLCOSYLATION WITH SULFOXIDES AND SULFINATES AS DONORS OR PROMOTERS (David Crich and Linda B. L. Lim). 3. ADDITION OF ORGANOCHROMIUM REAGENTS TO CARBONYL COMPOUNDS (Kazuhiko Takai). 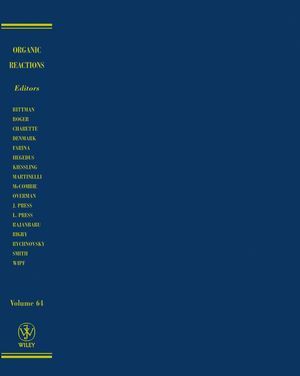 CHAPTER AND TOPIC INDEX, VOLUMES 1–64.